How sweet are your newfs? Ours are made from the finest quality solid chocolate, available in either milk or dark. A Black Paw Studio exclusive, our 8 piece box is packaged with a ribbon and bow and ready for gift giving. 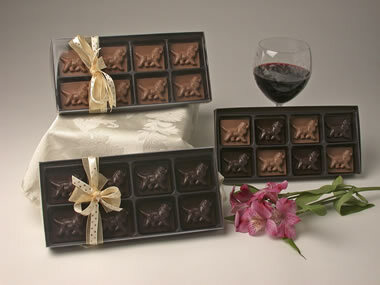 Select a box of mixed milk and dark Sweet Newfs, all milk or all dark chocolates. To ensure the quality of our Sweet Newfs chocolates, it may be necessary to ship them in a warm weather package using frozen, reusable gel packs. Warm weather packages are highly recommended from April - October or whenever they are being shipped to an area where temperatures are 70 degrees and above. Only one is necessary for each order. They are an additional $4.00. All orders are shipped USPS Priority Mail.